I notice that, as I type, I haven’t written an entry since June 25th, yet the last few months have easily been the most eventful for me since I started this journal. I finally sold my house in Derby, and moved to Leicestershire, where I’m happily co-habiting with my wife for the first time since we got married in 2007. What to write about, then? I could write about the experience of stepping out of my front door for the very last time, in September. I’d spent the previous twenty minutes sitting on the carpet in my empty living room, recalling the key memories from the years that I lived there, all of them concerning women, as it happens. Perhaps I could write something about the process of looking for a new house – the disappointments, the disagreements, the stress, the anticipation, then the elation when it’s all gone through and an estate agent hands you the keys. Or a few words about our new home – a charming, modern three storey house overlooking a village green. Or I could write about how nice it is to finally be living with my other half, or less positively, perhaps a paragraph or two on the challenge of adjusting to the endless compromises, the sudden scarcity of solitude, and a 17-yr old stepdaughter with a short fuse and an unusually self-centric worldview. Or maybe, on the penultimate day of the decade, I should post a sentimental retrospective of the last ten years? For me, the noughties, and of course the current millennium, began in a flat in South London. I was with my girlfriend, Polly. I spent the next two years in London, then moved back, highly reluctantly, to Derby in 2002. 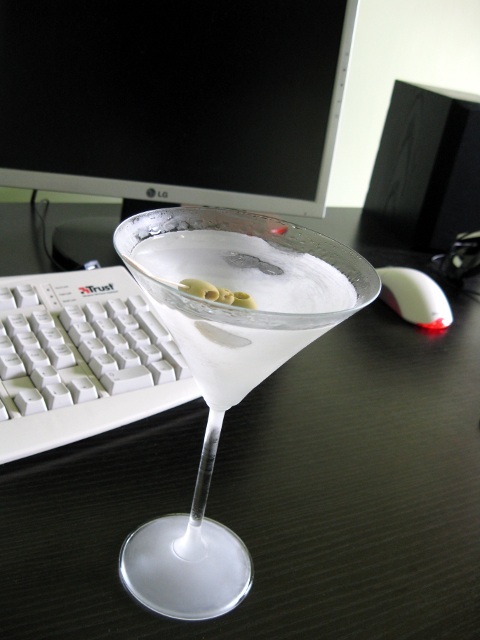 Now I grant you, the time-honoured methods of preparing a martini involve ice in some way. But whether you shake it or stir it, the ice has two purposes – to reduce the temperature of the vodka, and to dilute it. These can be achieved by other means. First, make sure you’ve got a cocktail glass in the freezer. It’s best to keep a couple in there at all times, I find. Depending on the mass of the glass, I think it needs at least 15 minutes in there. Next, pour roughly 90ml of vodka, and 20ml of water into a container. I like to use Smirnoff Black Label or Absolut combined with Buxton spring water in a small glass jug. You can vary the quantities to taste, of course. If you keep the vodka and the water in the fridge as I do, it will be ready in about 20-25 minutes. If you leave it much longer, it will turn into a sort of vodka slush puppy. You don’t want that. Other acceptable brands are Russian Standard and Finlandia. The latter in particular is very smooth while the former has a pleasing peppery bite. There’s an English brand called Chase which is made from potatoes and is phenomenal, but it’s about £40 a bottle. When glass and vodka/water mix are adequately chilled, remove the glass from the freezer. Now prepare a lemon twist. You do this by peeling a length off the lemon peel, as though you were peeling an apple, with a sharp knife. You want about 60mm, though that’s not critical. Try not to descend into the flesh of the lemon, though it’s not a showstopper if you do. Trim the sides so it’s nice and straight, and twist it. This is not merely an aesthetic exercise – twisting it will coax some of the lemon oil out of the peel, onto the surface. You can use a lime instead of a lemon if you prefer (as indeed I do, but I think my taste is unusual in that respect). Throw it into the glass. Alternatively, if olives are your preference, skewer up to three of them with a cocktail stick and place in the glass. Dribble a small quantity of vermouth into the glass. Half a capful is too much. Really, the easiest way to ruin a martini is by pouring too much vermouth in it, and overpowering the taste of the vodka. One way to make sure you don’t do that is to swirl a little around the glass and pour it down the sink. Honestly, what’s left clinging to the side of the glass is enough. Finally, pour the vodka/water mix into the glass. If you’re using olives, you might try half a teaspoonful of the brine from the jar, for a ‘dirty’ martini. But that’s an acquired taste. Keep the olive jar in the fridge if you’re going to do that. Of course, you could use gin instead of vodka – in which case you can use slightly more vermouth, because the flavour is a fair bit less delicate. Now drink it while it’s cold.